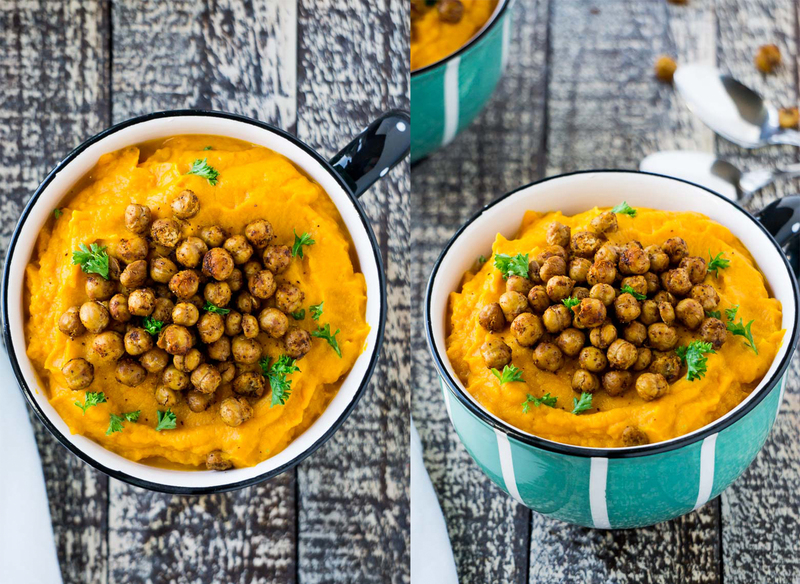 Roasted Carrot & Turmeric Purée | Eat. Love. Namaste. When I was younger, I was not a fan of carrots. I didn’t like them raw or cooked. It’s funny because now that I am older, I love carrots; both cooked and raw for snacking. Now that my taste buds have grown up I have been experiencing with different spices with my dishes, and it’s amazing how they can transform a meal! Here, I roasted carrots spiced with turmeric and wow, the flavors are like ‘POW’! Instead of adding roasted carrots to our dinner, I was craving a mash of some sort and decided to blend the carrots with coconut oil and water. Blending it made a flavorful purée that was the perfect side of our dinner! 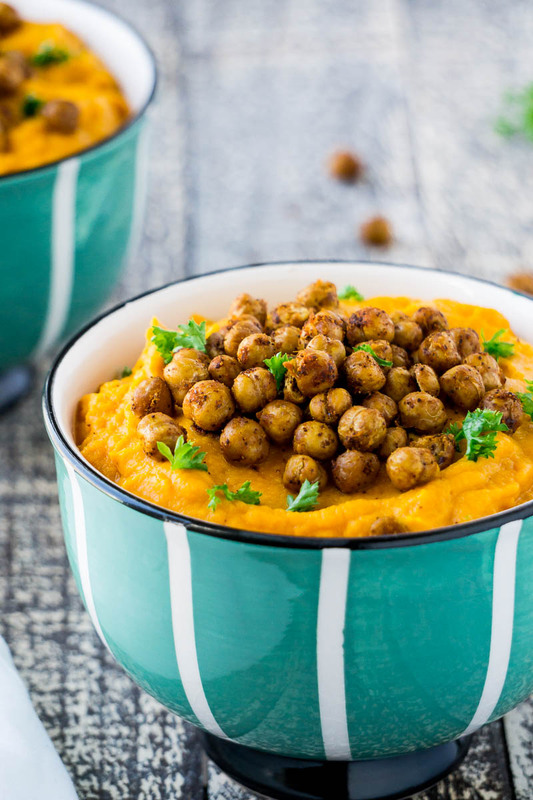 To get a little more protein in our meal, I topped the purée with crispy, spiced chickpeas; and boy it was a great addition! I highly recommend this topping, but it’s completely optional! 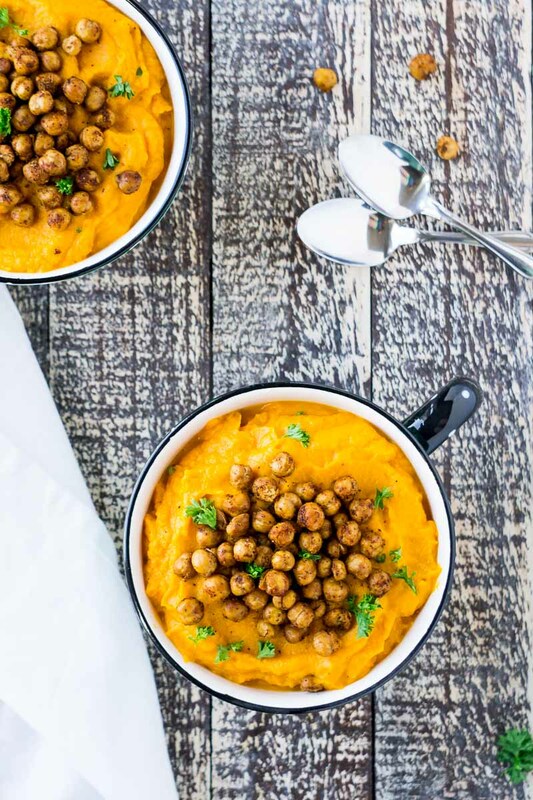 This Roasted Carrot & Turmeric Purée is great on its own served with roasted chickpeas or a perfect side to a delicious meal! Preheat oven to 400 degrees Fahrenheit and line a baking sheet with foil and set aside. Add onions, carrots and garlic cloves to the pan and season with turmeric, sweet paprika, salt, and pepper. Add two tablespoons melted coconut oil and massaged the veggies until well coated with spices. Bake for 25 minutes or until tender to pierce with a fork. 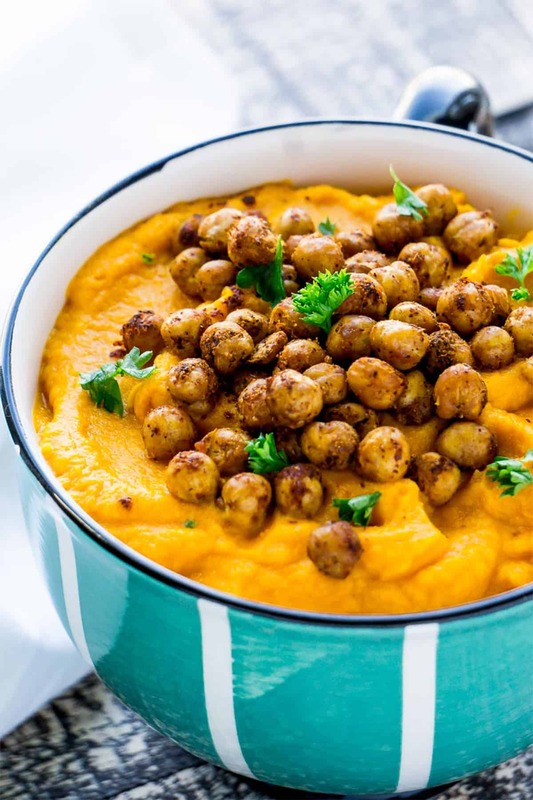 Remove from oven to cool slightly and transfer the roasted veggies to a high-speed blender and add the remaining two tablespoons coconut oil and 1/4 cup filtered water. Blend and continue adding 1/4 cup water untiled desired consistency. Taste and season with additional salt and pepper as needed. Serve as is, or add roasted chickpea and fresh chopped parsley. Preheat oven to 400 degrees Fahrenheit and line a baking sheet with foil. Rinse and dry 1, 15-oz can chickpeas and place the lined baking sheet. Season with 2 tablespoons coconut oil (melted), 1 teaspoon sweet paprika, 1/2 teaspoon garlic powder, 2 teaspoons chipotle powder, 1/4 teaspoon black pepper, and salt. Bake for 35 minutes or until crispy. 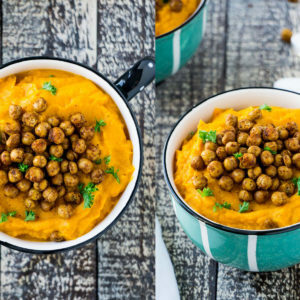 Let the chickpeas cool for about 10 minutes before using.